Ireland is in deep fiscal trouble and the Germans and the French apparently want the politicians in Dublin to increase the nation’s 12.5 percent corporate tax rate as the price for being bailed out. This is almost certainly the cause of considerable smugness and joy in Europe’s high-tax nations, many of which have been very resentful of Ireland for enjoying so much prosperity in recent decades in part because of a low corporate tax burden. But is there any reason to think Ireland’s competitive corporate tax regime is responsible for the nation’s economic crisis? The answer, not surprisingly, is no. 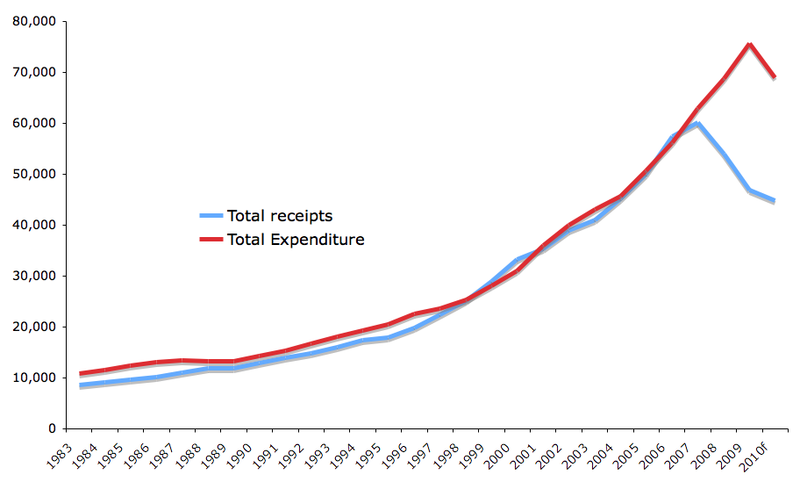 Here’s a chart from one of Ireland’s top economists, looking at taxes and spending for past 27 years. You can see that revenues grew rapidly, especially beginning in the 1990s as the lower tax rates were implemented. The problem is that politicians spent every penny of this revenue windfall. When the financial crisis hit a couple of years ago, tax revenues suddenly plummeted. Unfortunately, politicians continued to spend like drunken sailors. It’s only in the last year that they finally stepped on the brakes and began to rein in the burden of government spending. But that may be a case of too little, too late. The second chart provides additional detail. 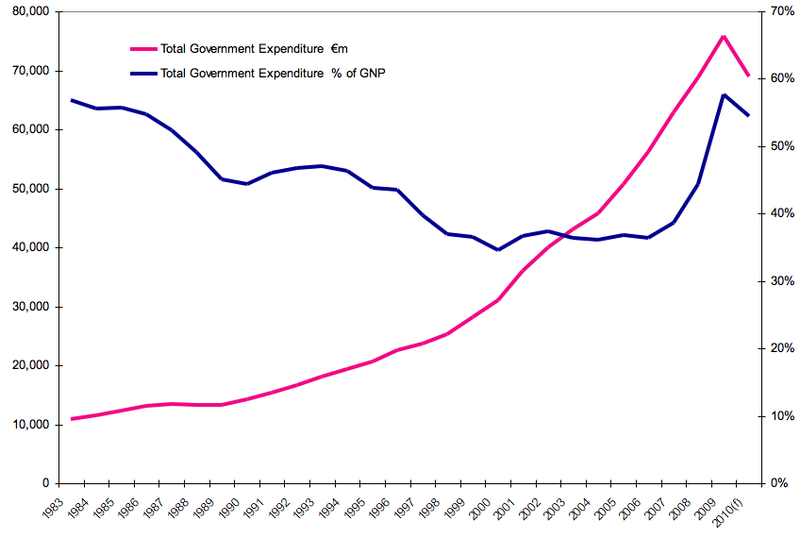 Interestingly, the burden of government spending actually fell as a share of GDP between 1983 and 2000. This is not because government spending was falling, but rather because the private sector was growing even faster than the public sector. This bit of good news (at least relatively speaking) stopped about 10 years ago. Politicians began to increase government spending at roughly the same rate as the private sector was expanding. While this was misguided, tax revenues were booming (in part because of genuine growth and in part because of the bubble) and it seemed like bigger government was a free lunch. But big government is never a free lunch. Government spending diverts resources from the productive sector of the economy. This is now painfully apparent since there no longer is a revenue windfall to mask the damage. There are lots of lessons to learn from Ireland’s fiscal/economic/financial crisis. There was too much government spending. Ireland also had a major housing bubble. And some people say that adopting the euro (the common currency of many European nations) helped create the current mess. The one thing we can definitely say, though, is that lower tax rates did not cause Ireland’s problems. It’s also safe to say that higher tax rates will delay Ireland’s recovery. French and German politicians may think that’s a good idea, but hopefully Irish lawmakers have a better perspective. on January 19, 2014 at 9:11 am Mirror, Mirror, on the Wall, Which Nation Has Increased Welfare Spending the Fastest of All?